Portugal escaped another embarrassing home result in the EURO 2016 qualifiers, after seeing Cristiano Ronaldo rescuing the 3 points against Armenia, already inside the last 20 minutes of the game. With tonight's goal, the Portuguese forward also became the all-time top scorer in European championships, qualifiers and final stages included. The new Portuguese National Team coach may have just taken over the reins last month, but he can already be proud of having put Portugal on the right course to a potential qualification for the EURO 2016. The "Lusitanos" started by beating Denmark in a dramatic fashion exactly a month ago and even though this Friday night the goal may have arrived earlier than it did in Copenhagen, the truth is that these 3 points didn't come very easy for Fernando Santos' men. The 60-year old manager lined up with a sort of a classic 4-4-2 formation, with Rui Patrício in goal, right behind a back-four formed by Raphael Guerreiro on the left, Bosingwa on the right, and a centre partnership between Pepe and Ricardo Carvalho. In midfield, the hosts paired Tiago next to João Moutinho, which ended up granting more freedom to the attacking roles fulfilled by Nani and Danny. Upfront, Hélder Postiga was played next to Cristiano Ronaldo. As soon as the game resumed for its second half, Fernando Santos ordered several of his players from the bench to start warming up. After having lost against Albania in the opening round of their EURO 2016 qualifiers journey, Portugal simply couldn't afford to drop any more points at home. Éder would come in for Postiga in the 56th minute and shortly after, Danny was replaced by Ricardo Quaresma. It was that second substitution that turned out to be more fruitful for the Portuguese Team though, with Quaresma playing a decisive part in the build-up for the only goal scored in the Algarve this Friday night. The 71st minute was about to run out in the Algarve Stadium, when a great combination play between Nani and Quaresma allowed for the FC Porto midfielder to get himself in front of Berezovsky. His first shot got saved by the Armenian goalkeeper, but following the extreme passivity from the visitors' defending men to clear the ball away from danger, Nani got anouther touch to it and assisted Cristiano Ronaldo for an easy tap-in goal. 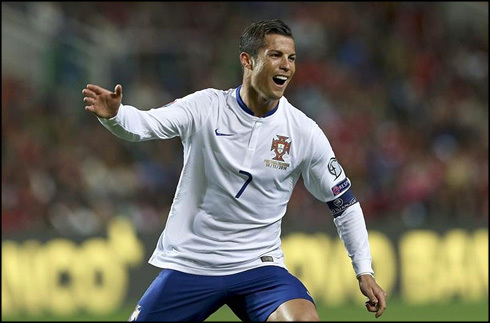 It was his 52nd goal in 117 caps and his 5th for Portugal in the 2014 calendar year. With no further official fixtures scheduled before March of 2015, Portugal will now take on Argentina in a friendly international in Manchester, at the emblematic Old Trafford stadium. Next Tuesday, Cristiano Ronaldo and Lionel Messi will go head to head, one last time before the FIFA Ballon d'Or 2014 winner is announced on January 12 of 2015. Attackers: Cristiano Ronaldo, Hélder Postiga. Cristiano Ronaldo next game will be another cap for the Portuguese National Team in a friendly international against Argentina, scheduled for next Tuesday, the 18th of November. You can watch Juventus live stream, Portugal vs Argentina, Spain vs Belarus, England vs Slovenia, Italy vs Croatia, and Netherlands vs Latvia, all matches provided from our live soccer streaming game pages.